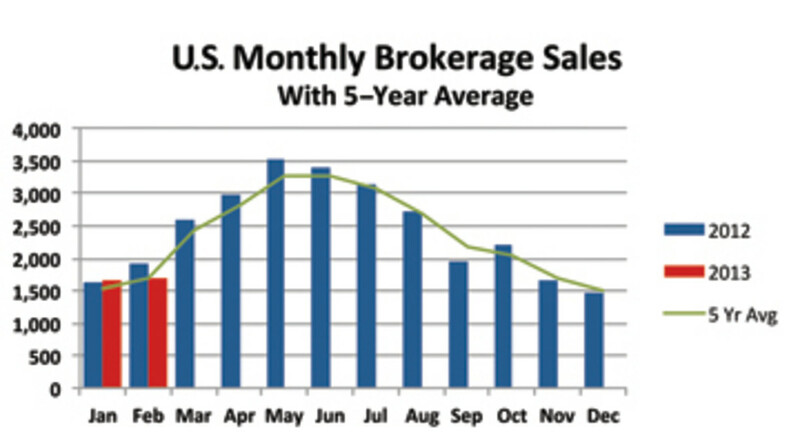 U.S. brokerage sales have been on a bumpy track for the past six to eight months. Alternating every month or two since July, sales have been higher and then lower than the same month in the previous year on a fairly regular basis. Although YachtWorld member brokers often tell us sales have improved, the aggregate they’ve reported in Soldboats.com, their proprietary database, showed a slight decline in unit sales during the eight-month period, from 16,879 to 16,541 boats sold. February was a down month in the up-and-down sales pattern. Sales were 14 percent lower than a year earlier, at 1,679 boats, compared with 1,942 in February 2012. Compared with the five-year average for February of 1,707, sales were down only 28 boats. The total value of boats sold in February declined by 9 percent, a slower rate of decline than unit sales, which means the average price at which a boat was sold increased. Often during a given month this is the result of unusual sales in the superyacht segment, but we can point to the midsize segments in February and say the average price improved there, as well. For boats under 26 feet, the average increased from $20,100 to $21,500, and in the 26- to 35-foot range the average rose from $54,600 to $57,300. The powerboat sector as a whole declined significantly in February, from 1,581 boats sold to 1,343, a 15 percent drop. The total price paid for powerboats fell by 13 percent, from $206.4 million to $180.4 million. By comparison, the sailboat market declined by 7 percent, from 361 to 336 boats, and the total price paid for the boats increased 21 percent, to $29 million. The average prices paid for sailboats increased in several size categories. Although 30 fewer sailboats were sold in the 26- to 35-foot range, the total price increased $71,000, to $6.5 million, and the average price was up from $34,978 to $42,253. In the 36- to 45-foot range, the total price increased, as well, by $1.6 million, to $12.4 million, and the average price rose from $96,671 to $104,995. Two months into the new year, the number of brokerage transactions is down 7 percent, or 49 boats, with 3,352 boats sold. The aggregate price paid increased during the period by $20 million, or 5 percent, with sales of $444.2 million. The strongest category is the 36- to 45-foot range, where sales increased 3 percent, with 760 boats sold, and the total value was up 4 percent, with $101.5 million in sales. The weakest category was boats 56 to 79 feet, off 28 percent, with 84 boats sold, and a total price down 20 percent, from $85.2 million to $68.2 million.